Once you’ve navigated the somewhat confusing walkways of the barbican estate you’ll find the conservatory located on the 3rd floor above the Barbican centre. 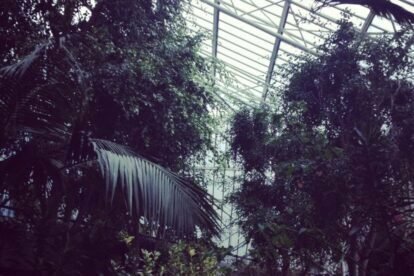 London’s second largest conservatory is home to some 2000 species of tropical plant life making it a surreal paradise in one of the most urban parts of London. This unexpected peaceful retreat is also home to a variety of quails and finches and a pond with huge Koi Karp that seem to epitomise the perfect Sunday floating around in this leafy hide-out. It’s the perfect place to sit and read a book or just soak up the scenery.